Lately I’ve seen a lot of buzz about the newest “Girl Effect” video, which argues that the fight to end poverty starts with one girl. 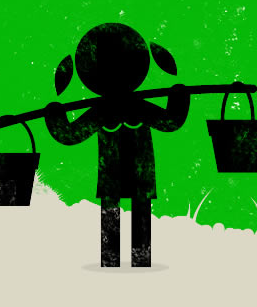 When a girl turns 12 and lives in poverty, she faces the risk of being married by 14 and getting pregnant by age 15. Chances are, she may become a prostitute so she can make enough money to support her family. That in turn puts her at risk of getting HIV and other diseases. But, the video says, there’s a solution. Rewind a few years. Picture a girl at age 12 whose family has enough money to take her to the doctor and keep her in school. She’s healthy, she can avoid sexually transmitted diseases and have children when she’s ready. Her children can be healthy like she is, and so can her children’s children and so on and so forth. The video works so well because it features kinetic typography (basically, moving text) that helps make the information easier to retain, digest and remember. Plus, when you see that cute little cartoon figure in the video, you can’t help but want to sympathize with the video’s message and perhaps even donate money to help out a young girl. The “Girl Effect” video reminds me a bit of Sarah McLachlan’s “World on Fire” music video, which I’ve always loved in part because it only cost $15 to create — a far cry from the absurd amount of money that most music videos cost. The song and the video send a powerful message about poverty, but the text sometimes scrolls so quickly across the screen that the message gets lost. The video was made in 2004, so that helps explain the issue. Funny to think about how much better we’ve gotten at creating good videos for the Web.